Start with some clean and level flooring to give your project at solid start. 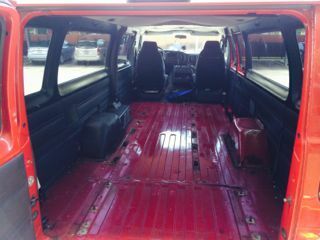 Place a layer of particle board that covers the entire cargo area of the van. Fasten the new sub floor to the frame using sheet metal screws and then cover the entire area in a seamless layer of vinyl. In order to be able to measure, cut, and fit the sub floor, all seats and flooring have to be removed. You will need the ratchet set to remove any seat brackets and seatbelt mounts. 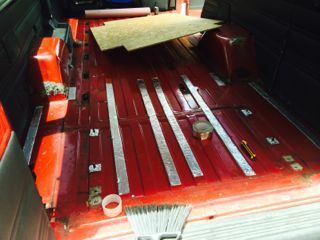 When this step is completed, the entire cargo area sheet metal floor should be exposed. This step is the foundation of all future projects. You want to make sure to create templates (using something like the red rosin paper) and use any existing bolts to screw the wood down after the floor is completely covered. This is where the insulating tape (thick duct tape) and sheet metal screws come into play. You want to put the tape down on the raised beams within the floor, place the cut flooring piece on top of that, and securely attach it using the sheet metal screws. Do steps three and four until the entire floor is covered and fastened to the frame of the vehicle. Make sure that all seams between sheets of wood are as tight as possible because a gap could cause the vinyl flooring to sag at some point in the future. You will end up with a brand new floor that is easy to clean and at the same time provides a solid foundation to attach benches and cabinets in the future. If you have quick release seats (picture above and to the left), take the extra time to make cut outs in the new sub floor that allows them to fit into place after you are done installing everything. This preserves some of the functionality of the van and I am very happy that I took the time. Do you have any more pictures of the cut outs for the seats? I am curious how you hide them when the seat is out.